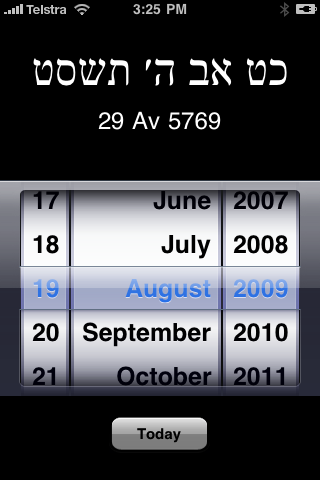 See the Hebrew Date software at the iTunes App Store. This utility converts between Gregorian and Hebrew dates. It is totally resident on the iPhone and, as such, doesn't require any Internet bandwidth for its operation. Quick and convenient, Hebrew Date, gives you the Hebrew date corresponding to any Gregorian date, past or present. Just spin the dials and read off the equivalent date in the Jewish calendar. Looked up another date, then just press the 'Today' button to instantly return to the current date. Send mail to research@research-systems.com with questions or comments about this web site.